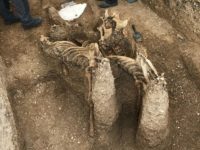 Excavations near the Yorkshire town of Pocklington have discovered two rather gruesome Iron Age burials. One of a younger man who was speared repeatedly in the grave. The other was a senior man buried in a chariot with two horses. Both burials date to the 3rd century B.C. The young man was between 17 and 25 years old when he died which appears to have been from natural causes. What happened to him after his death was not so natural. A detailed examination of his skeleton shows that, probably after his death, his body had been ritually pierced by nine spears (five with iron tips and four with bone ones). He had also received a potentially lethal blow to his forehead, delivered with a wooden club or other similar weapon. It’s not clear why his body was treated in such a manner. His grave and goods indicate he was a respected individual, a warrior. It’s possible he was “killed” again by weapons of war to convert his natural death into a warrior’s one. He could also have been deemed a danger, so much so that his corpse needed rekilling as in the case of vampire burials. The spears were left in the body, a tactic common in revenant prevention practices. Lastly, he could have been actually killed by the spears, placed in the grave alive and then speared to death. 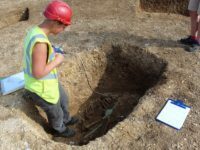 Ritual murders are not unheard of in Iron Age Britain, but their victims are usually found buried in bogs. The distinctive blow to forehead could have been struck first to silence and still the intended victim. 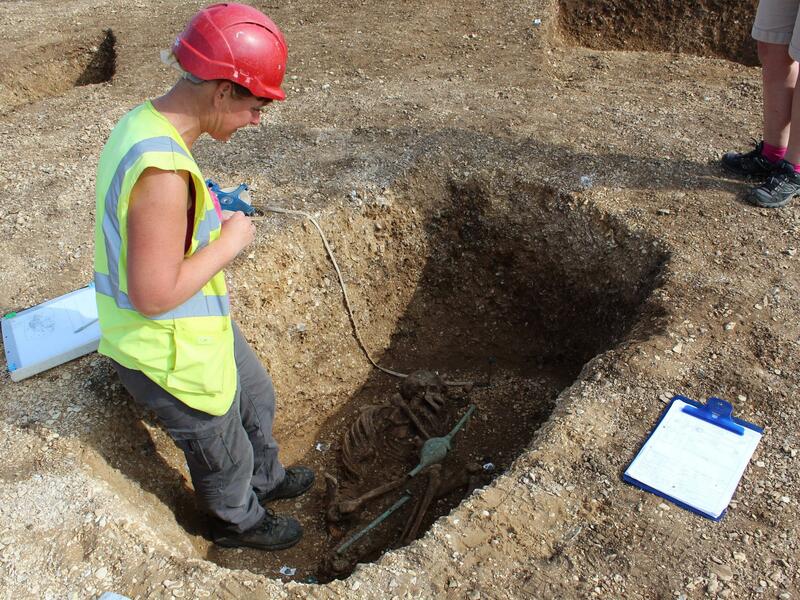 Fourteen other speared corpse burials have been found in Yorkshire. They contain between four and 15 spear jabs. The Pocklington burial was in the middle as to the number of times the deceased was pierced with spears, but it is at the top of the heap when it comes to condition. It is one of the most complete speared-corpse burials ever discovered. Less than 200 feet away from the young warrior’s grave, archaeologists found the burial of a man who was in his 60s or 70s when he died. He was buried in his chariot yolked to two adult ponies. They weren’t dead. Not yet. However, it is likely the animals were put in the grave alive and then yoked to the chariot, as if in motion. 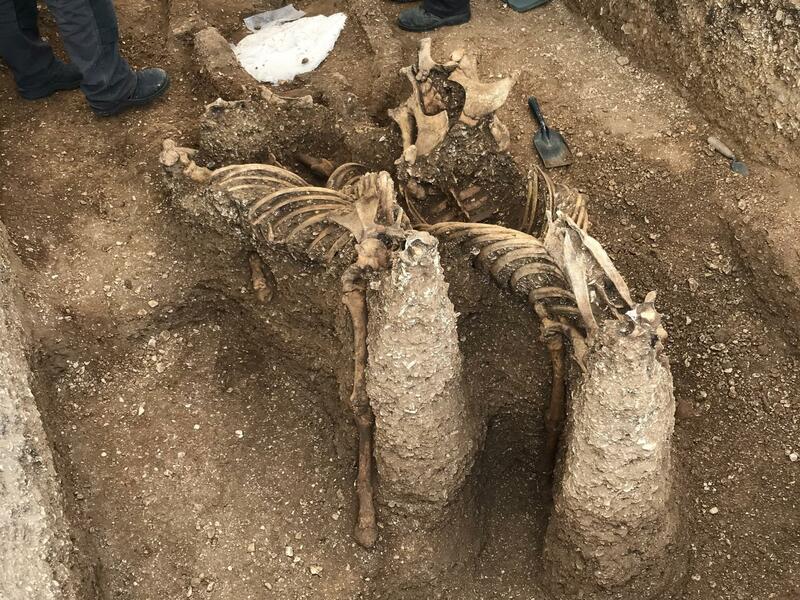 It appears the grave was then filled up with earth around the two live ponies, the chariot and the dead man. Probably when there was sufficient earth in the grave to prevent the animals from moving, they were killed and decapitated. Their heads were then removed from the grave, perhaps even to “stand guard” outside the mound that was then constructed over the elaborate burial. The archaeological evidence shows the man was sent off to the next world, not only in his chariot pulled by his still-standing ponies, but fully clothed and wearing a fine bronze brooch. He was lying in a foetal position on his highly decorated 35cm diameter bronze, wood and leather shield and surrounded by the bones of six piglets, whose flesh had almost certainly been devoured during the man’s funeral feast. This entry was posted on Saturday, December 8th, 2018 at 11:45 PM	and is filed under Ancient. You can follow any responses to this entry through the RSS 2.0 feed. You can skip to the end and leave a response. Pinging is currently not allowed. I am not in the least surprised. I lived in Yorkshire for a while. “Please, spear me,” he croaked. A friendship between the two realms is retained long after Pwyll’s death; in the fourth branch, Pryderi, Pwyll’s son and lord of Dyfed has received a gift of otherworldly pigs from Arawn. These pigs are eventually stolen by Venedotian magician and trickster, Gwydion fab Don. Gwydion poses as a bard, and asks to be rewarded for his poems and music with the pigs Pryderi owned. According to Pryderi, he is still in a pact with Arawn and cannot give the pigs to anyone. Gwydion then tricks Pryderi into trading him the pigs (as that is allowed in the deal with Arawn), which eventually leads to Pryderi’s invasion of Gwynedd. In the ensuing war, Gwydion kills Pryderi in single combat.